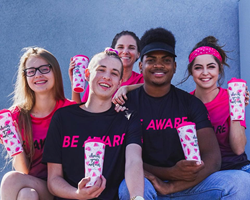 Each year Dutch Bros supports breast cancer research and patient support through it's "Be Aware" campaign. This year Dutch Bros was able to raise $220,000. Dutch Bros is excited to support great organizations fighting to end breast cancer. In honor of Breast Cancer Awareness Month, all Dutch Bros locations partnered with their communities to raise $220,000 for the OHSU Knight Cancer Institute and Albie Aware in support of the advancement of breast cancer research and services for patients. “We’re stoked to be able to contribute to the continued research and services that these wonderful organizations provide,” said Travis Boersma, Co-founder Dutch Bros Coffee. During the entire month of October, Dutch Bros locations donated $5 from the sale of each specialty “Be Aware” travel mug to raise funds. The sales were in conjunction with Breast Cancer Awareness month, and each purchase provided an opportunity to increase awareness of this disease and its impact on those fighting it. Dutch Bros locations across seven states raised $203,800 for the OHSU Knight Cancer Institute. The funds donated will support their research into treatment and preventative methods for breast cancer detection. They take an individual, personalized approach with each patient’s care, utilizing cutting-edge technologies, including DNA specific drugs and radiation therapies. Dutch Bros locations in Sacramento raised $16,200 for Albie Aware, a local non-profit organization that works to bring awareness, while also focusing on support services for breast cancer patients. Funds raised will directly benefit Albie Aware as they provide life-saving education, testing, patient advocacy and compassionate care for individuals facing or fighting breast cancer. Dutch Bros Coffee is the country’s largest privately held, drive-thru coffee company, with more than 290 locations and 7,500 employees in seven states. The rich, proprietary coffee blend is handcrafted from start to finish. Each ingredient is measured, every process timed, and each cup perfected.